That’s what I get for failing to check my email all weekend. Phil Thornton sent me a vintage photograph when I had the time to examine it at leisure and do some diligent research, and I muffed the chance. Fortunately, Phil and his family had already shaken out most of the important clues. Phil’s niece found the century-old snapshot in one of the drawers of an old dresser. So future generations wouldn’t be left entirely in the dark, someone had written the name “Steve Lovewell” on the back of the photo. Steve, the son of Kansas pioneer Thomas Lovewell, is obviously the sturdy gentleman with the square jaw who assumes the posture of a man overseeing the operation. This leaves us to figure out the identity of the other man, and the reason both are posing for a photograph on a railroad handcar. What was significant about this day that prompted someone to bring a camera to a railroad worksite somewhere in rural Jewell County, Kansas? I don’t know for sure that what follows provides a definitive identification, but an item from a 1922 issue of the Lovewell Index could answer all of those questions. 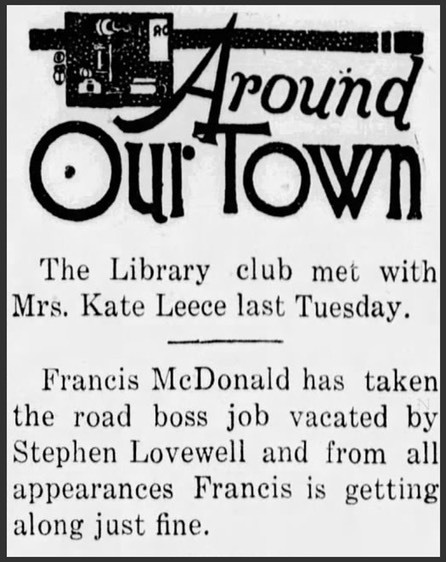 At the end of summer in 1922 Stephen Lovewell stepped down from his job as a “road boss,” to be replaced by Francis McDonald, who was 17 years his junior. For anyone who follows this blog, the name of Stephen’s replacement may sound familiar. Francis was the eldest son of Will McDonald, whose death in a freak handgun accident in 1913 was the subject of much back-and-forth speculation by Dave Lovewell and me a few years back. While walking out to the road to do some target practice one day, Will dropped his shiny new .38 revolver, which discharged as it struck the ground, shooting its owner through the heart. Will’s grown son Francis was summoned home from California to help his mother and his numerous siblings manage their new farm a few miles south of Lovewell. The salary from Francis’s railroad job must have provided a welcome supplement to the family’s limited farm income. In the 1920 census, conducted seven years after his father’s death, Francis was still living on the family farm in Sinclair Township with his mother Addie and four younger brothers and sisters. By the way, the eldest of Francis’s sisters, Margaret McDonald, appears as a solemn 10-year-old schoolgirl on the front row of a group portrait from Sinclair School in the Lovewell-album section of these pages. As if to underscore the idea that this site is starting to resemble a gigantic jigsaw puzzle whose interlocking pieces are gradually coming together, Lovewell Library Club hostess Kate Leece, mentioned in the “Around Our Town” item above, is also represented by a photo on this blog (See “Proximity”). Born in 1874, Stephen was also the product of a second marriage, his father Thomas Lovewell’s union with Orel Jane Moore, who was slightly more than half her new husband’s age when they left Iowa together in 1865. As a result of these age-mismatched pairings (not uncommon for second marriages of that era), when Stephen’s youngest daughter Rhoda was born, she was welcomed into the world by siblings who were already in their late thirties. That’s a lot of information to be reminded of by a lone photograph of two gents working on a railroad in 1922. Phil Thornton’s family apparently found a few more clues by examining the original snapshot with a magnifying glass. 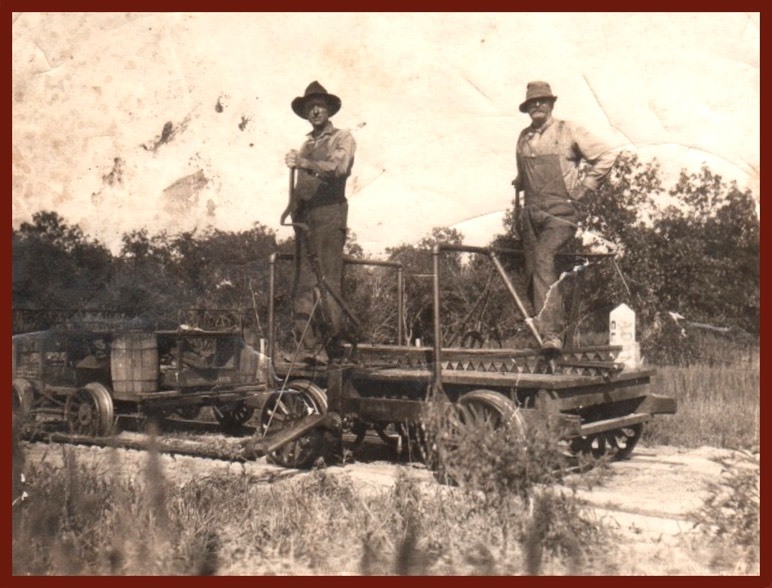 The men appear to have been cutting weeds along the road, since there’s a scythe arm on the handcar. A marker at the far side of the track bears the name “Adam” or “Adams.” One eagle-eyed viewer spotted the word “Fairbanks” somewhere on the car, probably indicating that it was manufactured by Fairbanks, Morse & Co., which began putting its brand on railcars in 1919. The photograph which Phil’s niece found must have been taken between 1919 and 1922, and may indeed have been a record of Steve Lovewell’s last days as a road supervisor, shortly before passing the baton to the younger man who replaced him. In doing a bit of research I found a few related items that are worth sharing. They’ll wait until next time.